A recent New York Times article, published in late August, discussed a new study, which estimated the number of species living on the Earth to be approximately 8.7 million, give or take 1.3 million. To me, this number seemed astronomical (though I sometimes feel that there are 8.7 million different species of bugs that manage to get into my house every week). After reading a few articles on the study, something got me thinking. In one particular article, it is noted that one of the study’s authors feels that population estimate studies are particularly important due currently accelerated rates of extinction, brought about by a host of human activities. This piqued my curiosity. With 8.7 million estimated species on the earth, just how do the extinction rates measure up? I decided to check this out. To begin, it must be noted that I am by no means a scientist. Scientific background aside, a wealth of research on my part made clear that there is at least a shaky consensus among some scientists, noted here and here, that under the natural order of things (known as the background extinction rate), somewhere between 10 and 100 species would go extinct per year. The IUCN estimates, however, that the current extinction rate is 1,000 and 10,000 times higher than it would naturally be. What this shows me is that while there appears to be no general consensus on exact numbers, one thing is for sure- the extinction rates are a lot higher than many are comfortable with. So while 8.7 million may seem astronomical, the truth is, it isn’t. Research is telling us that climate change, habitat destruction, and human population growth, among other factors, are seriously altering species’ ability to survive on the Earth, and these 8.7 million species are dwindling at much faster rates than they should be. Perhaps this study should be our wake up call that perhaps 8.7 million species on Earth might just be a million or so too few. 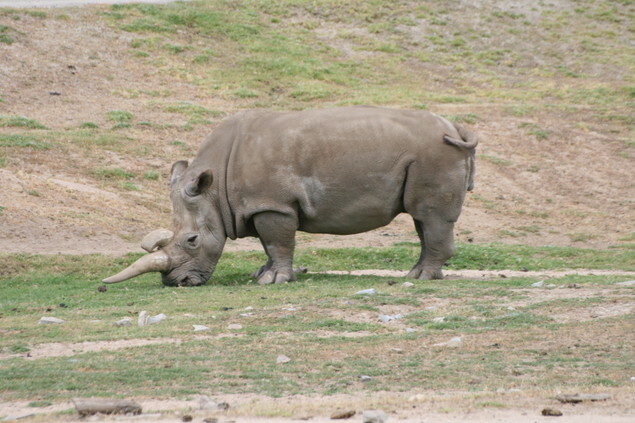 *Note: the photograph accompanying this blog post is of a Western Black Rhinoceros, believed to now be extinct. That we need to ack more responsibly has been clear for quite some time, I think.